LIKE the Aerospace Educators’ Workshop on Facebook! On Saturday of the SUN ‘n FUN Fly-In is the annual Aerospace Educators’ Workshop. From the moment you arrive and get your official totebag, you will be immersed in aviation and space activities to ignite learning in your classroom. After participating in hands on sessions, meeting other aerospace educators, and gaining a huge assortment of materials, enjoy a catered lunch while listening to our keynote speaker will be announced at a later date. The annual Ray Lien Award will be presented to an outstanding aerospace educator. Choo se from 15 concurrent sessions held in the Central Florida Aerospace Academy. Seats are limited. Register today. 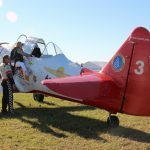 And, you could be one of four lucky teachers who flies with the Aeroshell Aerobatic Team. Motivate your students to reach the sky! For more information, please email Barbara Walters-Phillips. To register, complete the form below. Registration is $20.00 for teachers and administrators. All other non-educators pay the regular SUN ‘n FUN admission price at the main registration gate and may join you for lunch ($20). The registration fee includes all sessions, a tote bag, lunch and admission to the SUN ‘n FUN Air Show after the workshop at 2:00 P.M. Please—no children. 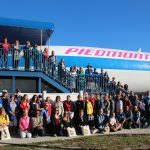 Concurrent sessions will be held in the Central FL Aerospace Academy and the Boeing 727 classroom and include hands on sessions by aviation education specialists from NASA, CAP, FAA, AOPA & classroom teachers. (Many sessions are STEM focused.) Visit Aerospace Discovery at the Florida Air Museum and tour the flight line. Lots of door prizes and 4 participants will fly with the AeroShell Aerobatic Team during the workshop. The rides are for teachers currently in the classroom, and they must be physically able to climb into the cockpit, without assistance, and weigh less than 250 pounds.) In-service points are available upon request. Please proceed to the bottom of this page to register for this workshop. To see the full schedule of sessions click HERE. 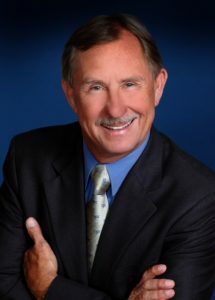 John “Lites” Leenhouts, CEO and President of SUN ‘n FUN Fly-In International and The Aerospace Center for Excellence located in Lakeland, Florida, is a 27-year veteran of the United States Navy with a distinguished record of service as a carrier fighter pilot. Lites passion for aviation has spanned over nearly 5 decades from hitch hiking to his first airshow as a young kid to retiring from the United States Navy in 2001 as the Commodore of the Strike Fighter Wing Atlantic. Lites holds the distinction of being the most experienced US Naval aviator of all time having successfully completed 10 major deployments and achieved 1,645 arrested carrier landings. After his retirement from the Navy, Lites worked for over 10 years for the Northrop Grumman Corporation. He created a successful, teaming arrangement with the Boring Corporation to modify, repair and overhaul all variants of the F/A-18 Hornet and Super Hornet. “Lites” became the CEO & President of SUN ‘n FUN, Fly-In, Inc. in 2011 and steered the corporation to new heights that most could only dream of. Forming and guiding the SNF team, he drove he organization to become debt free for the first time in over 4 decades. Additionally, Lites has founded and molded the Aerospace Center for Excellence, a subsidiary of SNF whose mission is to populate the aviation industry with aerospace professionals. Lites and his wife Nancy enjoy flying in their 1930 Waco or 1964 Piper Comanche, driving antique British cars, or riding their Harleys on the many back roads of our great nation. Ray Lien was reputed as an excellent aviation educator. He envisioned an Aerospace Educators Workshop in 1988. Ray was introduced to aviation in 1925 by his Platte, South Dakota, neighbors. Ray enlisted in the US Army Air Corps in January 1942. Throughout WWII, Ray served as a Maintenance Officer in various locations, but predominantly in North Africa with B-26 and B-25 aircraft. After the war, Ray joined the Air Force Reserve, where he continued to serve in the maintenance field until his retirement as a Lieutenant Colonel in 1970. Ray Lien earned a BS in Agricultural Engineering from South Dakota State College in 1941 and an MS in Agricultural Engineering in 1958. He actually began teaching at Purdue University in 1953, which he continued until 1987. He was one of the few Purdue University faculty to ever rise from an Instructor to Full Professor without earning a PhD. In 1988, he became Coordinator (and later Chairman) of Educational Project for SUN ‘n FUN and started the first Aerospace Educator Workshop. In Ray’s honor, we proudly present the Ray Lien Award annually during the SUN ‘n FUN International Fly-In & Expo during the Aerospace Educators Workshop. This award is given to recognize an individual who has made an outstanding contribution to aviation education. The award will be presented on Saturday, April 6, 2019 at SUN ‘n FUN in Lakeland, Florida during the Aerospace Educators Workshop. We request the recipient be present at the Workshop to receive the award. Anyone can nominate a person and it can be self-nominated. The nominator must submit a letter of support for the candidate by describing his/her contributions to aviation education. The recipient must agree to present a session for teachers at the following year’s workshop. The nomination letter of support should be emailed to Bill Yucuis no later than March 15, 2019. Direct any questions to: Barbara Walters-Phillips at 407-497-1236. Please register early. Last day to register online or by mail is March 30th. If registration is not purchased by March 30th, onsite purchase can be made the day of the event, Saturday, April 6th at Teachers’ Workshop ticket window (near Main Admissions). Parking is $10.00. Email Teresa Urban for registration information. To register online, fill out the form below and proceed to purchase your admission online by clicking submit. To register by mail print out and complete a hard copy registration and mail along with payment (check) to: Teresa Urban, Aerospace Educators’ Registration 2600 Harden Blvd, Lot 317, Lakeland, FL 33803. 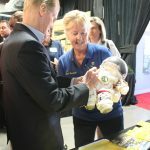 Checks are payable to Aerospace Discovery at the Florida Air Museum. By registering, you are granting permission for SUN ‘n FUN to use your photo for promotional purposes.